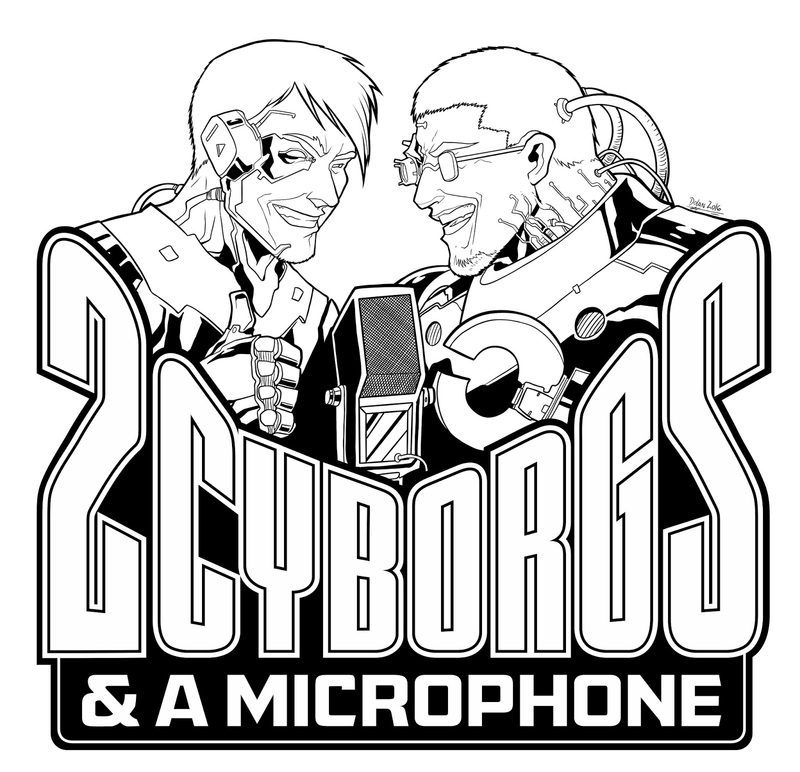 Editing for episode 054 of Two Cyborgs and a Microphone was delayed. The editing went very well, but I had to do it from a hotel room as my work sent me away for a week. There are worse things, so I can't complain. The episode turned out very well and is going to be the episode I refer new people to when I tell them about the show. If you haven't listened to the show yet, this would be a perfect place to start. Here is our unedited video recording (34:35) and here is the show page for the edited podcast with episode 054. The EmerKeyB was abandoned for the time being. It was a cute project, but it had to give way to more exciting and valuable projects. Still, a lot was learned, so it was far from wasted time. In the image, you can see the device successfully changing a single character as the knob is turned. There is plenty of information if someone really wanted the completed project, but it was far from complete. 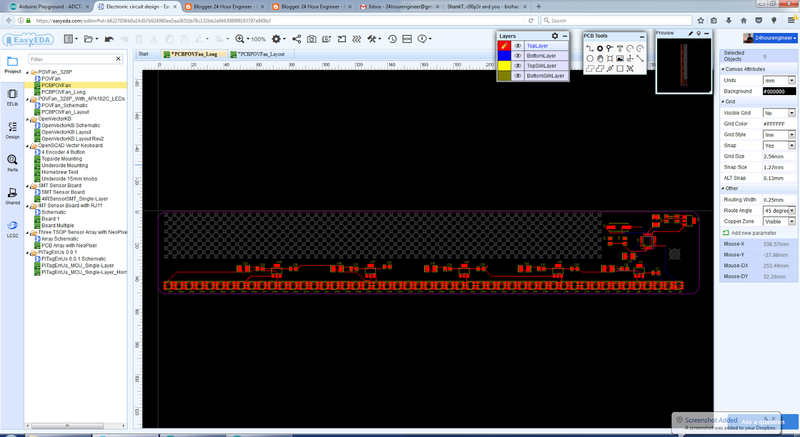 It mostly needs a revision to the board to make it fit nicely on the Beetle and an enclosure. Another project is being posted which was never completed. 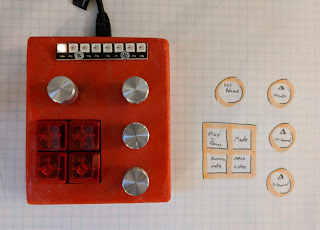 This one is a Persistence of Vision (POV) spinner based on a hand fan. It was meant to display different patterns when it was spun or waved. A lot was learned during this project as well, so it seemed worth posting. 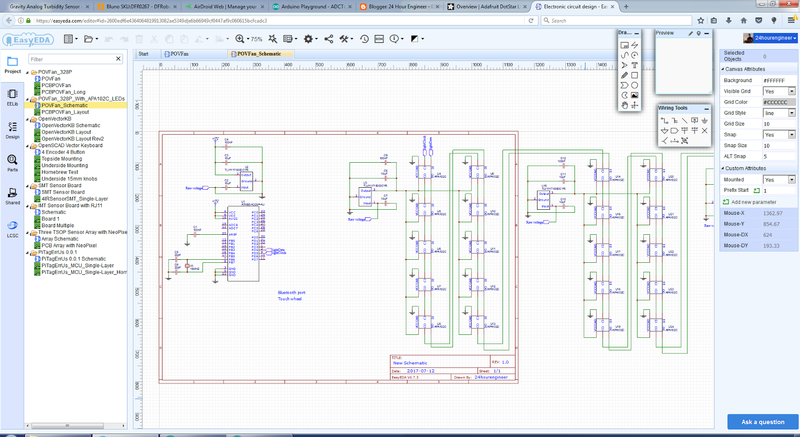 A schematic was sketched up in EasyEDA which included 60 addressable LED modules, a controller, accelerometer, and power conditioning. The first revision of the PCB layout was completed to show how the board would be produced. The idea was to put all the devices on a single PCB and make it the top panel of a folding hand fan. Moving parts on a tablet computer are not common. 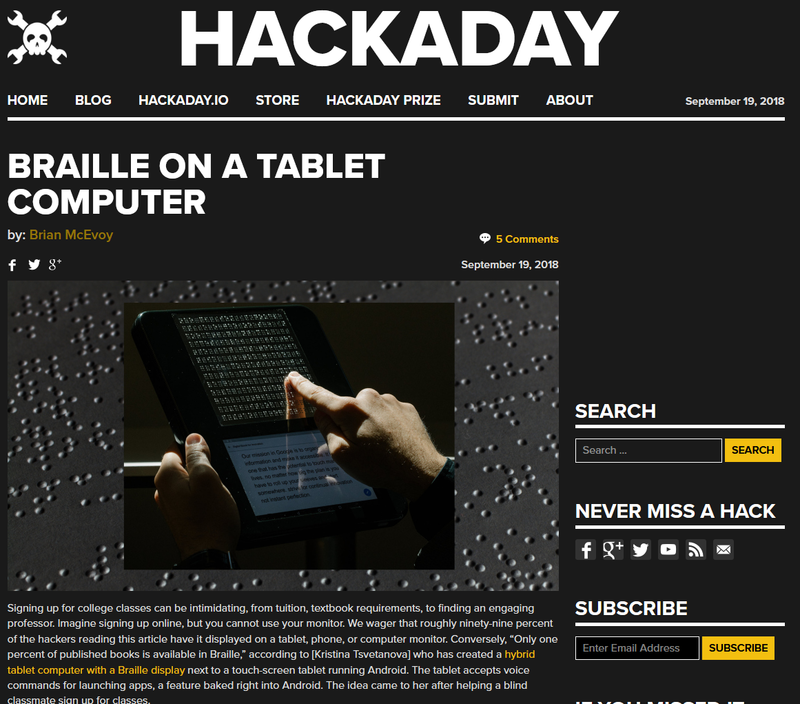 Hundreds are even less common, but this tablet integrated a refreshable Braille display so blind readers could get live information instead of waiting for published versions. 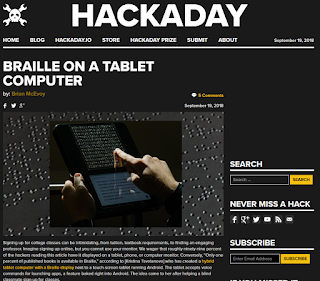 This also allowed more natural interaction with modern technology for the blind. 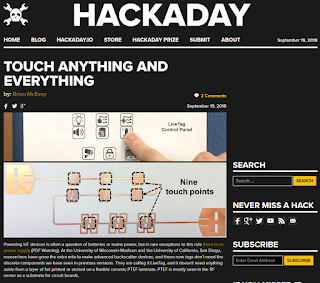 Touch interfaces are hardly new, and wireless ones without any power supply are showing up more, but ones without any components, simply traces on a substrate, are pretty exciting. 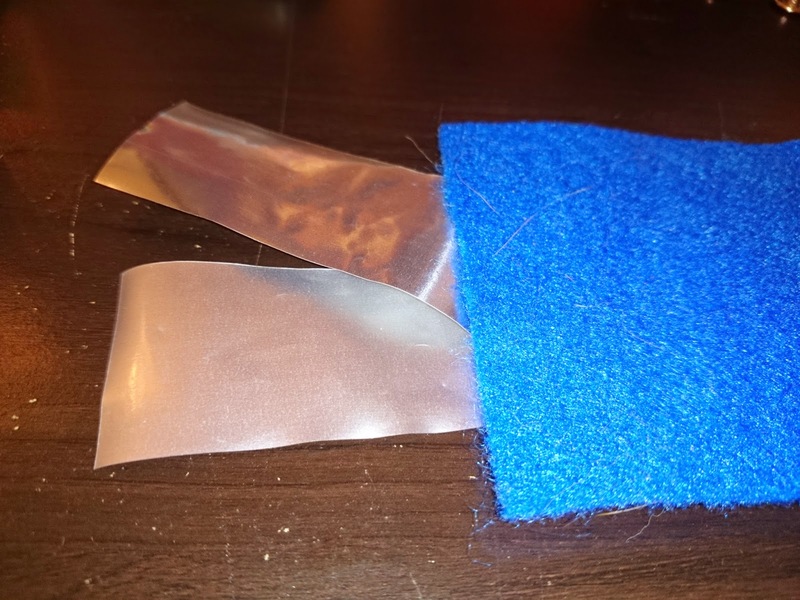 This used backscatter to harvest and disrupt existing wifi signals to send coded information to a router about the state of the buttons or switches being touched.